My goal is to show why it's always true. 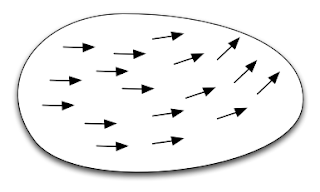 Think of the vectors as being drawn literally in the surface so that if we were to pick up the surface and stretch it like a piece of rubber the vectors would get stretched with it. 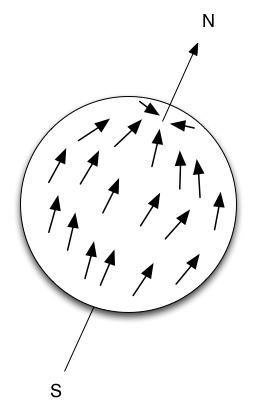 Remember that a vector field is defined everywhere in the domain so the arrows are just a random sprinkling of examples to show what's going on. 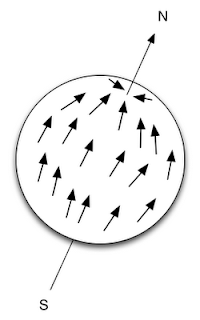 For this to be an accurate picture you want to imagine an infinity of arrows, one at every single point of the domain. The vectors start off pointing to the right. They swing anti-clockwise by about 45º and then swing back to where they started. As the journey is a loop they clearly must end where they started. A different, really swirly vector field, might have resulted in arrows that that rotated around hundreds of times along your journey. But by time you reach the end of the journey they must swing back to where they started. What's slightly less obvious is that they'd also have to rotate back to cancel out the hundreds of swings. 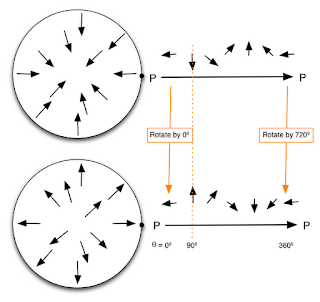 You might think "the vectors could rotate round a hundred times but as long as they make exactly 100 turns they'll return to where they started and there's no need for them to unwind". But actually, every bit of rotation in the journey must be unwound. 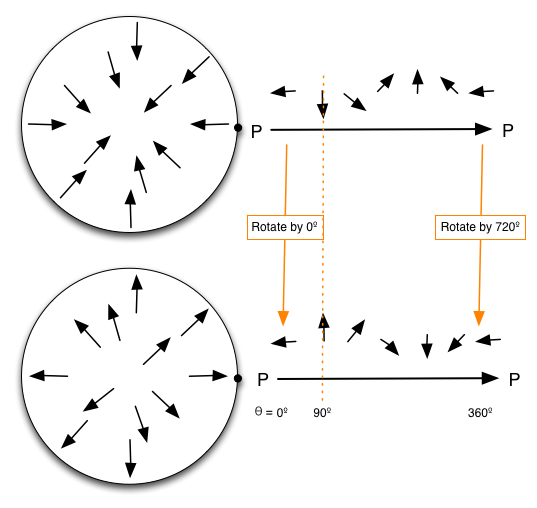 The total amount of rotation, adding all the positive rotations, and subtracting off the negative rotations, is called the winding number for the loop. 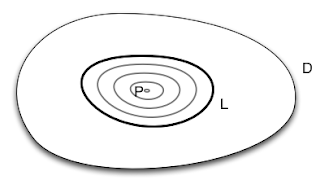 We count anti-clockwise rotation as positive and clockwise as negative. So I'm claiming that the winding number for a closed loop in a simply-connected domain is always zero. Here's why the winding number for simply connected domains must be zero: firstly - it's pretty clear that the winding number for any loop must be an integer. If the winding number was a half, say, the arrow wouldn't end up pointing 180º from where it started which makes no sense for a closed loop. 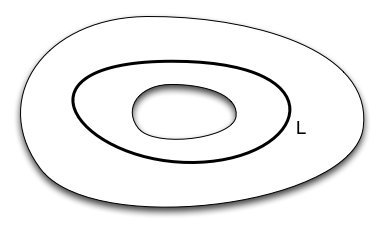 Now the domain is simply connected, so the loop can be shrunk to a point. Now imagine doing the shrinking really slowly and keeping track of the winding number as the loop shrinks. As the loop shrinks, the graph of the vectors along the loop must vary slowly. 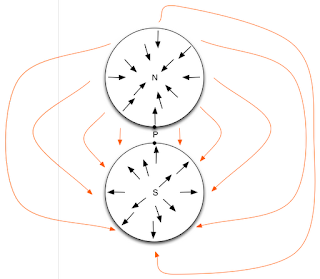 The total winding number depends continuously on the vectors in the graph so the winding number must vary slowly as the loop shrinks. But the winding number is an integer. It can't change really slowly, it can only change by amounts of a whole integer. So the winding number can't change at all. Every loop in a simply-connected domain must have a winding number that's the same as the winding number of a loop that is just one point ie. zero. At this point you may be tempted to say "aha! That's a continuous vector field on the sphere that's non-zero everywhere!" Alas, it's not defined everywhere. It's a vector field everywhere except at the north and south poles. If you're at the north pole, no non-zero vector can point north. And at the south pole every non-zero vector points north with no continuous way to pick just one. 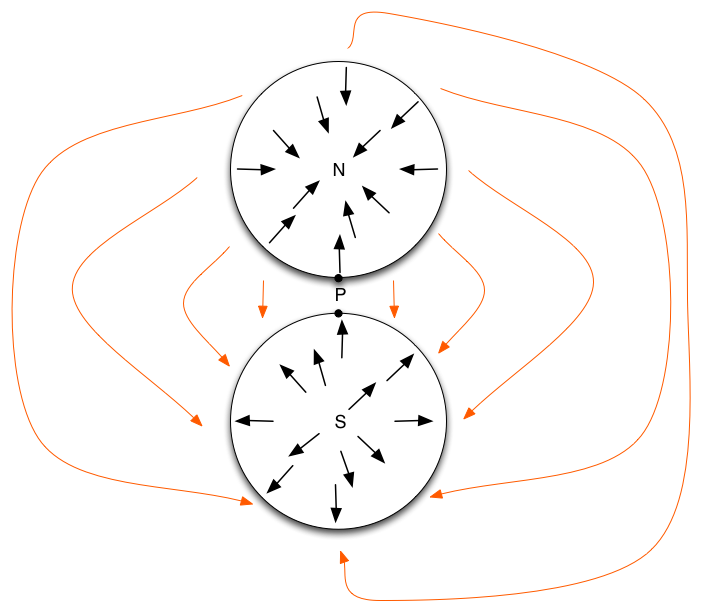 You reconstruct the Earth again by gluing the two disks together according to the orange arrows, and then inflating. Any vector field on the surface of the Earth gives rise to a pair of vector fields on disks like this. But there will be a constraint. The vectors around the boundary of the two disks will match. In fact, vectors at the opposite ends of the orange arrow have to match. But they won't necessarily be equal as drawn in this diagram because the disk for the southern hemisphere corresponds to a view from below. 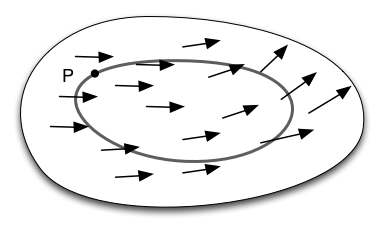 Along the equator, every vector on the surface is a linear combination of north and east vectors. So if it's true for both the north and east vectors then it must be true for all vectors. But if the graph for one picture of the equatorial loop has vectors that are 2θ more than the vectors for another graph, the first one must complete two revolutions more than the second one. So the first has a winding number two more than the second. 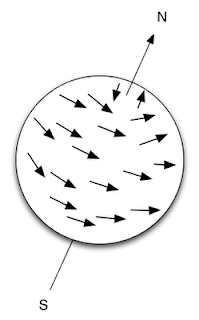 If you get stuck above I strongly recommend trying to draw some continuous non-zero vector fields on the sphere, transferring them to disks, and counting winding numbers. This proof is based on proofs I studied years ago relating to Chern classes. I recently became interested in Chern classes again because they play an important role in understanding phenomena in solid state physics such as the quantum Hall effect. That argument about slowly shrinking a loop leaving its winding number unchanged tells you a lot about slowly changing certain types of quantum system. It's possible I completely messed up. Here's an "elementary" proof. It looks much harder than what I did. But I feel like I did faithfully capture, in pictures, an argument that's buried in Lectures on Riemann surfaces. And it seems to correctly reproduce the Lefschetz number of 2. I bet this theorem fails in the effective topos, where there is a continuous map on the disc which has no fixed points (so it violates Brouwer's fixed point theorem). I was thinking about constructive versions of this when I hinted that there's a procedure for searching for zeros based on computing winding numbers around various regions. Like the intermediate value theorem I'd expect it to fail in a constructively. But many of these kinds of results have discrete versions that I suspect do still work constructively and there may be a version of this winding number argument that still works in that case. A typical constructive variant of this sort of theorem would be say that for every epsilon there is a vector whose magnitude is less than epsilon, which is usually strong enough to work with. Thanks a lot for this article! It helps me understood the intuition behind the otherwise impenetrable proofs. I found that this situation happens quite often in Math. The formal proofs just look like a bunch of symbols randomly put together. There are a few learning aids, they all talk about the same thing, the same thing that I don't understand. So after I have really determined to put everything together, I really got it. And then I find the concept, the core, to be quite simple. And then I realize that all the formal rigor was to say things exactly. However I think it's meaningful to put the beautiful core idea upfront, to get people interested. If we put rigor first, 95% people will give up before they actually understand the theorem. We need more articles like this for the modern math!